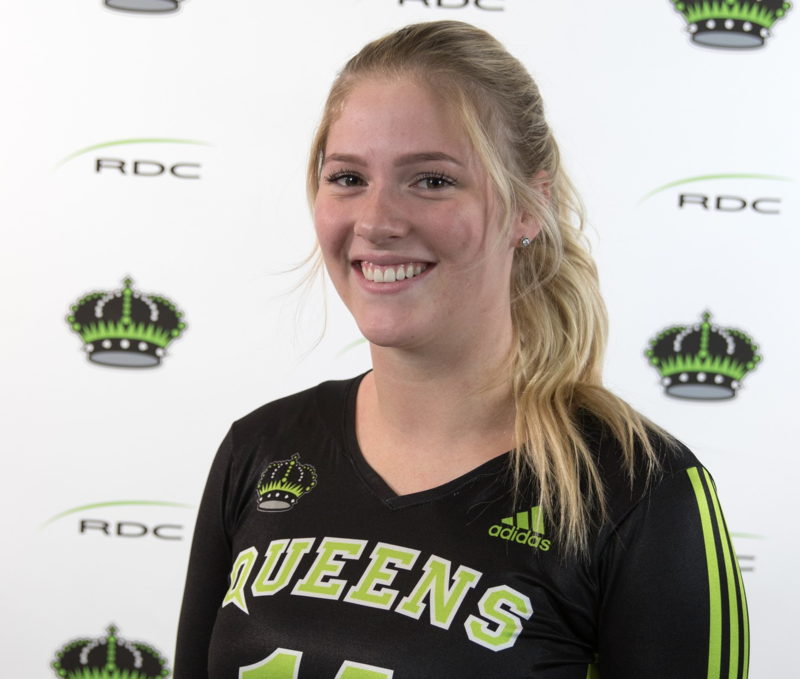 Alexandria Greenshields had a tremendous weekend on the court, helping the RDC Queens (14-8) defeat the SAIT Trojans (13-7) in a pair of matches to move even with the Ambrose University Lions (14-8) for second spot in the south. In Friday’s five set victory at the Gary W. Harris Canada Games Centre (25-22, 24-26, 27-25, 20-25 and 17-15), the five-foot-ten middle blocker totaled eight kills, two digs, two stuff blocks, one assist and one ace, accounting for 11 of the Queens’ points. Then on Saturday in Calgary, the first-year Open Studies student accumulated eight kills, five digs, four stuff blocks and one ace in another five set win (25-20, 16-25, 22-25, 25-20 and 15-13), contributing 13 more points for RDC. Ali has been an integral part of the Queens’ strong play. Since November 2, the Red Deer College Queens have been one of the hottest teams in Alberta Colleges Athletic Conference (ACAC) Women’s Volleyball, going 13-3 in their past 16 matches. This past weekend, Regan Fathers was a force for the Kings Volleyball team (16-6). The six-foot-six outside hitter had 23 kills, five digs and three service aces while hitting for 48.6 per cent efficiency in Friday’s three set sweep over the SAIT Trojans (25-20, 25-19 and 25-21). The fifth-year’s contribution of 26 points helped him earn the Kings Player-of-the-Game award. Despite dropping a close five set decision on Saturday (20-25, 25-23, 25-22, 18-25 and 17-19), the talented student- athlete from East Fremantle, Western Australia, accumulated impressive numbers once again. Regan’s 21 kills led the Kings in Calgary, while adding three digs and two blocks. The Kinesiology General student leads the league with 369 total kills and 5.13 kills per set. Regan will be a key player as the Kings prepare for the ACAC Championship from February 21-23 and the Canadian Collegiate Athletic Association (CCAA) Men’s Volleyball National Championship from March 7-9 at the Gary W. Harris Canada Games Centre, when the RDC Kings will be playing for their historic 14th national title. This week, the RDC Basketball teams will play the Olds College Broncos in a home-and-home series, which will include the President’s Challenge during half-time of both Kings games. The Hockey Queens will face-off against the MacEwan University Griffins in a pair of games and the Kings will challenge the SAIT Trojans twice. Both volleyball teams will travel to Lethbridge and play the Kodiaks in two matches. This weekend will also feature the final RDC regular season home games, except for the rescheduled Kings Hockey game at 1:30 p.m. on Friday, February 22 at NexSource Centre in Sylvan Lake. Here is a summary of what is happening this week in RDC Athletics. The Red Deer College Queens will play the Broncos in Olds. Sandra Garcia-Bernal continues to be one of top rebounders in the league. The second-year from Valencia, Spain sits third in ACAC Women’s Basketball, averaging 10.2 boards per game. The five-foot-five guard’s tremendous effort and anticipation have helped guide the Queens to the top of the league in rebounding (47.6 per game). The RDC Queens will tip-off against the Broncos on their home court. On the road, the fourth place Kings (8-8) will hit the hardwood against the Olds College Broncos (5-10), and it will be the first night of the President’s Challenge. Every game is significant as the RDC Kings look to lock down a playoff position in the south, and the Kings have been playing excellent lately with the postseason on their minds. The Kings and Lethbridge College Kodiaks (8-9) are even with 16 points in the south standings, but the Kings have a game in hand, as both squads battle for a playoff spot. After the home-and-home series against Olds College (5-10), the RDC Kings will play the Ambrose University Lions (12-6) once in Calgary and the Briercrest College Clippers (2-15) in two road games. The Kodiaks will wrap up the regular season against the Briercrest College Clippers (2-15) twice and the Olds College Broncos (5-10) in a pair of games. Red Deer’s Spencer Klassen continues to be a driving force for the Kings, leading the league with 25.7 points per game. The Red Deer College Kings will host the Olds College Broncos. At half-time, the second night of the President’s Challenge will take place in conjunction with Olds College. RDC President & CEO, Joel Ward, will compete against Stuart Cullum, President of Olds College, in a game of 21. The losing president from both evenings will have to the wear the other team’s jersey for a full day on Monday, February 11. If Ward and Cullum split the games of the 21, the point differential will determine the winner. The third place RDC Queens (8-8-4-0) will entertain the MacEwan University Griffins (13-4-2-0). MacEwan University sits in second spot in the standings with 28 points, six points behind NAIT (16- 2-2-0). The Red Deer College Queens have 20 points after 20 games and lead the fourth-place Olds College Broncos (6-11-1-0) by seven points. The RDC Queens will face-off against the Griffins in Edmonton. The Red Deer College Kings (13-5-1-1) will tangle with the SAIT Trojans (14-5-0-0) in Calgary. Both teams share second place with 28 points, although the Trojans have a game in hand. It continues to be a battle at the top of the standings. The NAIT Ooks (16-6-0-0) lead ACAC Men’s Hockey with 32 points, but have also played two more games than the Kings. The MacEwan University Griffins (13-5-1-0) sit in fourth with 27 points. The University of Alberta Augustana Vikings (12-7-1-0) are next with 25 points. The RDC Kings are the most disciplined team in the league, taking the fewest penalty minutes as a group. Although, even when a skater down the Kings can score, recording five shorthanded markers. SAIT’s Dean Allison leads ACAC Men’s Hockey with 30 points, but RDC’s Chase Thudium is close behind with 27. As part of a beer tasting event, participants are encouraged to make a donation with proceeds going to the Central Alberta Sexual Assault Support Centre (CASASC). Olds Brewery and Troubled Monk will be sponsoring the event. The Kings will face the Trojans at home. The second place Red Deer College Queens (14-8) will take on the Lethbridge College Kodiaks (3-17). The RDC team has really progressed, going 8-2 over the past 10 matches. Libero Kaylee Domoney has recorded a total of 364 digs, which is the most in the league. In an afternoon rematch, the Volleyball Queens will challenge the Kodiaks. The second place Red Deer College Kings (16-6) will face the undefeated Kodiaks (20-0) in Lethbridge. In the first weekend of the season, the Lethbridge College Kodiaks picked up a pair of tight five set decisions over the RDC Kings, but the Kings did not have all of their players in action. The Kings are ranked eighth and the Kodiaks are second in the CCAA. The RDC Kings have a postseason spot locked up already in the south but want to continue fine- tuning their game leading up to the ACAC Championship and CCAA National Championship. The Kings and Kodiaks will hit the court in the afternoon.